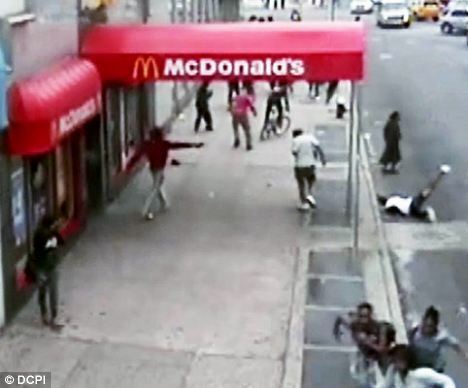 Home Tags Posts tagged with "mcdonalds tyquan sewall address"
Tyquan Sewall, the teenager shot outside Nostrand McDonald’s, Flatlands. 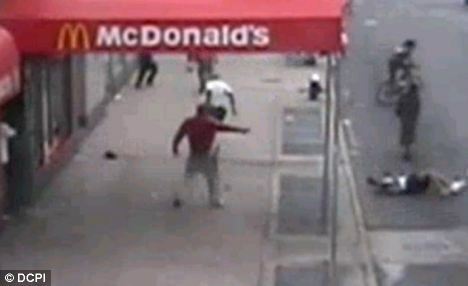 A dramatic footage of a teenager named Tyquan Sewall being shot at point-blank range in a gun ambush outside Nostrand McDonald’s has been released today. The images, which show the victim thrown into the road after being hit four times, was caught on camera in Brooklyn, New York. The teenager was left fighting for his life. New York police have launched a manhunt to catch three gunmen who carried out the planned daylight attack on Nostrand Avenue, Flatlands. The footage shows Tyquan Sewall, 18, who lives just blocks from the McDonald’s and nearby Brooklyn College, being shot at point-blank range. The first bullet grazed the left side of the victim’s head, sending him staggering backwards. Tyquan Sewall was then hit three more times and sent rolling out into the street, passing through at least two lanes of traffic. Terrified onlookers fled in panic as the shots rang out outside the busy restaurant chain. The weapon used was a .32-caliber Smith & Wesson. The man who fired the gun was wearing a bright red jacket. Two of the men then ran over and take the sneackers Tyquan Sewall had dropped onto the street before making off as police arrive. The shooting took place in Flatlands at around 3:00 p.m. on Tuesday. The victim was hit in the chest, groin and leg and is now in a critical condition in hospital. Police officers said before the shooting Tyquan Sewall had got into an argument on nearby Flatbush Avenue. During that argument, a man told Tyquan Sewall to come with him to the McDonald’s, police said. Tyquan Sewall followed, but couldn’t see a gun being passed around the three men. Two went in while one waited at the door as Tyquan Sewall approached. Then the two men inside McDonald’s came out and the gun was handed to one of them who opened fire. Police said the attackers fled out of the restaurant’s back entrance and dumped the loaded six-shooter in a rubbish bin a block away. Tyquan Sewall is in critical condition at Kings County Hospital, New York.